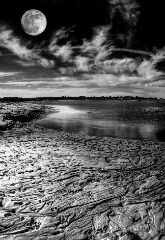 Hampton Photo Arts - Photography Art Prints – How are they made? You are here:Hampton Photo Arts Art Supplies Photography Art Prints – How are they made? So, when you are taking a photo for photography art print or poster you have to determine first the largest size of art print or poster that you are planning to make. To play it safe set your digital camera to largest size possible. Even an average digital camera will allow you take pictures up to 10MB in size, which is about 3600 by 2700 pixels. All newer computers can handle 10MB files fairly easily, plus you will ‘loose’ a few megabytes when you upload you photograph to a PC and when you edit it. I use Photoshop to edit photographs and create print ready files for prints and posters. There are many different photo editing software out there and majority if not all of them have the basics needed in the beginning. I just purchased standard edition Adobe Photoshop Elements 6.0 for a friend for about $80 at Costco a few months ago, and usually it is more than enough. A professional version can cost a few hundred dollars and has many more features, but it only makes sense for a professional photographer to buy it. Once you have uploaded your files to a computer you are ready to start editing. If Photoshop opened by default at the time of upload, close it and open it again in edit mode. (There is probably a better way to switch to edit mode, but I found this to be the easiest for me). When you open your photo the first thing you want to do is check your file resolution. Many products will open photo for editing with default resolution – 72 dip (72 pixels per inch). This is not enough for large photography art prints or posters, so you want to set it to at least 300 dip (300 pixels per inch, the higher the better, but higher resolution mean larges file sizes, and if they too large you might not even be able to save them is web formats like jpeg). Once you have set your resolution it is time to set your print file size. 1. Determine Scale – If your largest print will be let’s say 20 by 24 inches, then you have to keep in mind that when you scaling down to smaller sizes it has to be proportionate to the largest one, or the photo will either have to be deformed in width, height or both. You then will lose consistency in your prints, and sometimes even make them look bad. Also, it takes longer to make adjustments and edits with large file, so I usually start with a medium size, but before I save the file, I scale it up to the desired size. 2. Remember about borders – most of the photography prints or posters have a border around them. This is done on purpose, since they look better in a frame with a border. So, the image size would be actual picture size, plus the size of the border (In other words, if you printing 20 by 24 inches photo with 1 inch border on each size, your actual photo size is now 18 by 22 inches, and that is the size you need to use for scaling). You can also use border to your advantage, if a photograph can not be scaled to a smaller size using the same proportions, then you can increase or decrease the border to maintain the proportions. 3. Background - Another thing to remember, I seen great photographs were rejected just for that, when you select an object from a photo and remove background and just replace it with a filler (let’s say white color background) remember about the border. Will your print still look good with the border around it, or is it better to make a background different color then the border, so you can tell where the photo ends and border begins? There are hundreds of different way to edit the photo, so this is really just up to your taste and the end result you have in mind. Software’s manual will be the best guide for that. So you have a photo and it is perfect, but you need to crop it on with side or both. What is the best way to do this? Again, you have to know you final size for the largest print, and make sure that after you crop the photo it can be scaled up to the desired size without being deformed. Thus, when crop before you select your changes check to see if the end result can be scaled up easily, or if it is at least close to the desired size. (If I’m planning to create three different photography art print sizes, then I’ll use the medium one for editing, I also would zoom in as much as it makes sense, since with a lot of digital editing it is easier to see details that way). If you can not get the photo to the right sale due to the things that you absolutely have to crop to make the photo perfect, then see if you can adjust it and keep the end result acceptable. For example, you end up with 20 by 24.01 inches file after crop, if you chose not to contain proportions and adjust the file to 20 by 24 inches; the chances are the image will not be distorted much. But once you have done this, it becomes you ‘master’ photo, so only use your ‘master’ now to scale up or down to a desired size. If you made digital adjustments to your photograph, especially if you used tools to do it for you, you need to make sure there are no surprises. The best way that works for me, is I zoom to the actual size of the print and manually examine the entire photo. Many times unexpected details would appear even on an original photograph. So do your ‘do diligence’, check every part carefully. There are dozens, if not hundreds, different formats that that can be accepted by printers. Usually, tiff format is used for very high quality fine photography art prints and posters, jpeg on the other hand should be good enough to create large prints that are as good in quality as the prints you will find in most retail stores. So, check on preferred format with whoever will be printing these for you. Fourth thing – What Makes it Photography Art versus just a Photograph? I have asked this question myself number of times, but I do not think it there is a definitive answer. I would say if people like it and buy it, then it is photography art print and not just a large photo.